Quando non so cosa indossare è sempre il mio jolly: so che scegliendolo non potrò sbagliare. A volte, però, si rischia di risultare monotoni, addirittura cupi, se non si tenta di reinventare il look di tanto in tanto. Quindi, se anche voi, come me, siete amanti del nero, ma avete voglia di cambiare un po’, continuate allora a leggere per scoprire 4 modi per rinnovare il vostro total black! When it comes to fashion, what’s safer than black? We all know it: it perfectly combines with every colour, it has the ability to make every item elegant, and it is a real passepartout in every single occasion. When I don’t know what to wear it’s always my jolly: I know that I can’t go wrong with it. However, somtimes we might risk to result monotonous, even gloomy, if we don’t try to reinvent the look a little bit. So, if you’re a black lover just like me, but you fell like changing a bit, keep on reading to find out 4 ways to renew your total black! 1) Accessori colorati. / Colourful accessories. Qualche volta si può fare a meno dell’effetto “nero totale”. E allora, per spezzare la pesantezza di un outfit completamente “oscuro”, la soluzione migliore è quella di optare per degli accessori chiari, o dai colori vivaci. Un esempio? Una borsa chiarissima o degli stivali dalle fantasie particolari. Sometimes we can give up on the “total black” effect. So, to get rid of the obscurity of this kind of look, the best solution is to go for bright or light accessories. An example? A white bag or a pair of boots with a particular pattern. 2) Gioca con i contrasti. / Play with the contrasts. Un modo per rendere più innovativo un total black, è quello di giocare con i capi, indossando capi apparentemente in contrasto tra di loro. Una gonna in tulle ed un chiodo di pelle sono l’esempio perfetto. Il risultato è un look rock-romantico, senza ovviamente aver abbandonato il nostro colore preferito. 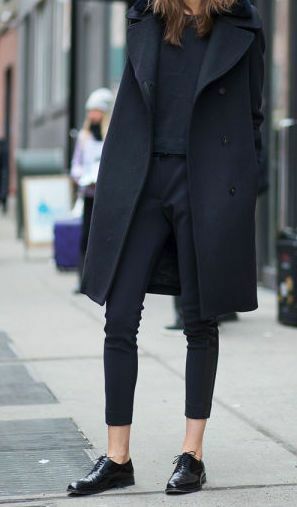 One of the ways to make the total black more innovative, is by playing with the clothes, wearing items apparently in contrast with each other. A tulle skirt and a leather jacket are the perfect example. The result is a rock-romantic look, without abandoning our favourite colour, of course. Per dare spessore al vostro look, optate per vari strati, da poter mixare, aggiungere o rimuovere a seconda delle circostanze. Un maglione oversize indossato sopra ad una camicia, ad esempio, vi permetterà di trasformare immediatamente il vostro outfit. To give more volume to your look, go for more layers to mix, add or remove depending on the circumstances. An oversize sweater worn over a shirt, for example, will make you able to immediately transform your outfit. Il miglior amico del nero? Il denim, ovviamente! Che sia un jeans, una giacca o una mini, questo tessuto si sposa alla perfezione con qualsiasi look total black. Inoltre smorza i toni cupi e ravviva l’outfit. Black’s best friend? Denim, of course! Whether it’s a jeans, a jacket or a mini, this fabric is perfect with every total black look. Moreover, it helps reducing the gloomy tones and it makes the outfit more lively. 26 risposte a "4 ways to renew your total black look"
Haha I have so many friends who wear nothing but black! Totally see the appeal tbh..
Adoro il total black! Questi outfit sono stupendi, casual e alla moda. Grazie mille Laura! Passerò sicuramente da te! Un bacio! I just love all of these tips! Thanks for the inspo babe!! All black outfits never seem to fail! Grazie cara! Passo appena posso sul tuo blog! Un bacione! Lovely Article! I enjoyed it very much! Also because I just wrote one about almost the same topic 😉 Great! Love these ideas, especially the one about layers! gorgeous!! love this look, you’re adorable! Love all these looks! Great tips!